Jared Unzipped: The Diner At The Edge Of Town. Bells rang out as a man of reasonable stature entered the Yellow Moon Diner. Letting the door slip behind him, it made a soft clank upon slowly snapping shut. Looking around the establishment, the gentlemen took note of the worn menu signs hanging above the service counter. A short, balding man with a plaid apron was busy tossing eggs and hash around the griddle. The sizzle of the frying food was only outweighed by the inviting smell of the cooking hash. The aroma filling the entire diner was like returning home after a far too long absence. Any loving mother would be envious. 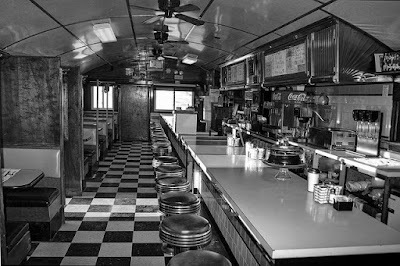 Nestled along the one of the lesser used roads leading out of town, the diner was essentially a long silver tanker with windows. Neon lights traced the edge of the roof, sending technicolor beams into the rapidly approaching wilderness. The radiant pulse eerily lit the few cars parked in front, turning them into spectral vessels in the darkness. The new customer took a seat at the counter. He immediately noticed how the stool, made of chrome and blue leather, spun so easily. Doing a complete rotation around his seat, he suddenly stopped to see the brightest of blue eyes staring at him from behind the counter. A young lady, whom couldn't have been more than twenty-five or thirty years old, stood eagerly with pen and pad in hand. Her uniform, a black and pink dress, was anything but drab. She had short blonde hair that shimmered with an opalescent quality. On her left shoulder sat a name tag that read Juniper. Slightly befuddled, the fellow glanced briefly at the menu board. "Hi Juniper. I'm Alvin. Two biscuits and a bacon omelet, please." Scribbling rapidly on her pad, Juniper made sure the cook overheard Alvin's order, then brought a glass of water. "So what brings you all the way out here? Wednesday nights are usually slow. Not too many customers if you don't count the crickets." Alvin peeled his trench-coat off and draped it over the stool next to him. Loosening his tie a bit, he let out a sigh. "I was supposed to meet a blind date here a few minutes ago, but I'm starting to wonder if she's going to show up." "Maybe she's just running a little bit late. Things happen." "I suppose. Though, I found it a little odd that she wanted to meet here at a diner. I've never even seen this place in my travels. My mom has mentioned it to me. Said she'd been here before... I think." Juniper cracked the smile of a rosy cherub. It was like the sun suddenly shoved the moon back in bed and rose unannounced. "We've got our regulars, mostly retirees. The breakfast rush is pretty tough, believe it or not. Lots of hungry truck drivers and farmers to feed. Coffee?" Alvin nodded and Juniper poured him a cup. "This is going to sound a little strange, but do you have any cinnamon? Old habits die hard." She miraculously produced a shaker from below the counter, to which Alvin promptly shook it thrice into his mug. "Not strange at all Alvie. You must have picked it up from one of your grandparents. The old timers ask for cinnamon in their coffee all the time." A now thoroughly surprised Alvin confirmed that he did indeed learn it from his grandfather, whom in turn picked up the trick while in France during World War II. As he stirred the spice into his drink, Alvin's face took on the look of wonder. How did she know? Juniper walked behind the griddle into the forbidden recesses of the diner. Like some mystical huntress, she reappeared with two of the tastiest biscuits Alvin would ever eat in his life. "Would you like some butter or jam?" Again with the latter, Alvin selected the peach jam. Juniper seemed to approve with her lively eyes. "I think the type of jam a person eats says a lot about them. Strawberry jam is great, but it's like chicken pox. Everyone has had it. Peach jam is far more extraordinary. Why eat strawberry jam when you can have something so delightfully peachy?" Never one to consider the merits of his jam preference, Alvin now had to face the facts -- he was an oddball. "You caught me red-handed. Sure, strawberry jam is tasty, but I like to live on the wild side!" Alvin shimmed in his chair a little bit and waved his hands over his head. "It's been many years since I've had peach jam. When life gives you the chance to taste the unordinary, you take it." Both hands were now firmly planted against Juniper's chin; her elbows were propped upon the counter. "I feel the same way. Why live in a world that's black and white when you can exist in full color?" "You got it, Juniper. Say, you're the only Juniper I've ever met. Strange name, but it has a nice ring to it." Twirling around to look over her shoulder, Juniper was busy checking on the omelet. Just about done, from the looks of it. "My dad wanted to name me June, but my mom thought it was so boring. They came to a compromise with Juniper. Pop would still call me June when mom wasn't around, though." "You must have heard a lot of tree jokes in school." "More than I care to recall." The cook plated the omelet on a large oval dish. Bacon jutted from both ends in random directions. The cheese was still bubbling on top, like a miniature volcano eagerly waiting to explode. Juniper swiftly delivered it to her hungry customer, noticing how happy he now appeared to be. "Your date is missing out. Did she give you her name?" Setting his fork on the plate, Alvin magnetically locked gazes with Juniper. He awkwardly knocked his butter knife off the plate and onto the floor, illustrating his klutzy nature. Bending over to retrieve the utensil, he bumped his head on a stool. Rising slowly, he just knew the waitress and potentially the cook would be laughing at him. Nope... just the waitress. Her hands were poorly hiding a deeply charming giggle. "A bit of a butterfingers, are we?" "Yeah. I've got the balance of an egg in an apple tree." "It's okay. I'll get you another knife." Returning to his now properly labeled throne of embarrassment, Alvin reached for the hot sauce and doused his omelet. Taking the first bite, Juniper came back with a clean cutting instrument. "You were about to say... her name?" Alvin swallowed another bite, then chased it with a swig from his coffee mug. "That's the weird part. My mom set this up. She didn't give me her name. Just a place and time to be. Mom said I'd know her by the wings she flew in with. It was cryptic. Made me double pinkie-swear promise to come. And to think... my date doesn't even show. Oh well. Mom tried, right?" "She did. Can't blame her for wanting you to be happy. Maybe next time." A bit depressed now, Alvin finished his first biscuit with peach jam and emptied his coffee mug. Juniper refilled the cup and gracefully prepared it with cinnamon for him. He smiled and said thank you with his eyes. "So what brings you to this diner? A smart gal like you could be in a law office or landing your millionth real estate deal." Juniper glided across the alley behind the counter and approached an empty stool next to Alvin. She hopped up and leaned her right arm against the bar. She waved her other hand through the air like an aspiring game show prize presenter. "This fine dining establishment is all mine. Mom and dad left it to me when they passed. I've been in this building since I was a little girl. Didn't feel right to sell it. Plus, I couldn't put Gordon out of a job. He's been here longer than I've been alive." She motioned to the plaid-adorned cook, whom stayed facing forwards, raised a hand in a half-committed wave and then stalwartly grunted. Alvin chopped at the last bits of his omelet, then dabbed his gooey biscuit in the leftover creme. It was a fantastic meal, he remarked to himself. Such a shame he had to eat it alone. "Well you've got a great diner, here. Very retro! Where did the name come from?" Her skirt revolved with the gyrating stool; Juniper apparently had a fancy for spinning around on them. "When my mom and dad first met, they were on a dock in the middle of a lake. They sat on the edge of that dock and talked all night. My dad said the moon that night shone the most piercing yellow that he'd ever seen. Pop took it as a sign that he was in love. I think he was right." "How long have your folks been gone?" Juniper glanced away, then back again. "Three years now. They were in a car accident." "I'm sorry. I can't imagine how tough that must have been." "Yeah. I got through it. Figure it's for the best, honestly. At least they were together in the end." Juniper hopped off her stool and walked behind the counter once again. She cleared Alvin's plate and utensils. A few moments later, she reappeared around the other side. "So... you've had a rough night, pal. Don't sweat the bill for the meal. It's on me." A knot formed in Alvin's stomach, swiftly torn from the recesses of uncharted quantum sub-space. Who was this girl? How could she be so sweet to a total stranger? "I can't just not pay you. That would be rude. I appreciate the gesture, though. I'll be okay, really. Wouldn't be the first date that didn't work out for me." Juniper swung her arm around Alvin's shoulders and hugged him. "Your company has been payment enough. Remember -- Wednesday nights are a graveyard 'round here." Alvin, not wanting her to let go, watched sincerely as Juniper danced past the seats lining the counter. Her feet exquisitely calculating each and every step -- she moved rhythmically with the pounding of his own heart. Trying not to be a deviant, Alvin couldn't help but notice the intricate art adorning Juniper's ankles. Upon each was a pair of tattooed wings, beautifully drawn with multiple layers of detailed black lines. Alvin's excitement couldn't be contained. He stood from his stool and nearly tripped with feverish trepidation. Rushing to Juniper's side, he embraced her -- not knowing if it was the right thing to do. She squeezed him back. With her face next to his, she softly whispered into his ear. Alvin's laughter ripped forth straight from his gut. He couldn't believe how dumb he'd been. Juniper, this wondrous, gorgeous, and altogether cheerful angel had been his blind date all along. "I didn't want to spoil the fun, Alvie. Plus... who wants to have a regular old first date? Wasn't this much more historic?" The rejuvenated lad couldn't agree more. This sprightly treasure had been right under his nose the whole time. "It's amazing the things a guy will tell his waitress, but not his girlfriend. I figured I could get a better read off you this way. Your mother agreed with me. Plus, we thought the surprise would make for a better memory. We'll look back on this when we're old and falling apart. You'll laugh and probably drop your dentures into a bowl of tomato soup." If Alvin's cheeks had turned any redder, he'd look like he was smuggling light bulbs in his mouth. "Are you so sure about you and I working out? I'm just some guy who walked into your diner." Her captivating face paused for a moment and stared at him, suspending time ever briefly. "Admit it, tiger. You fell in love the moment I gave you the cinnamon." Juniper bewitchingly winked and gave Alvin a kiss on the cheek. "You're sweet. Now don't spoil it. Give me your phone number and promise you'll come back tomorrow night for dinner. I'll even let you pay next time." Alvin spoke without a moment of hesitation. In the entire history of the human race, never before has a man made a promise so genuine, so pure. With every cell in his body, Alvin meant it. That night, Alvin walked out of the diner at the edge of town... but he couldn't have been closer to home.